New research from Lumen has crowned Facebook as the site with the most noticeable advertising for November. Eye tracking data from the Lumen panel reveals that 54% of viewable ads on Facebook were in fact viewed, while 42% of YouTube ads were actually looked at. Both sites significantly outperformed the digital display average of 18%. Our Panelists receive nectar card points for undertaking tasks, but have the opportunity to earn more if they leave their eye tracking devices on whilst naturally browsing. This gives us a wealth of information on what sites people visit, for how long and when ads are noticed and where. So, what has driven all this attention to Facebook’s advertising? Firstly, people spend a lot of time on Facebook: average dwell time per page sits at around 6 minutes. And it’s not just the length of time that matters here, it’s the quality of the time. You’d be surprised to know, people really are interested in their own Facebook feeds: they are fully in discover mode, on the lookout for posts that interest them. Secondly, the majority of Facebook’s advertising is in-line with content. Instead of trying to disrupt the viewing experience, working with it by using in-line ads can lead to not just a greater number of viewable ads, but also more viewed ads. Up next was Youtube. Similarly to Facebook, viewability teetered around the 30% mark (31.4%), of which 42% of ads were seen. This, again, is a staggering performance for digital advertising. But could they perform even better? The majority of YouTube’s advertising is pre-roll, where the ad is played before the videos viewers want to watch. Which essentially means people have to watch the ad (for at least 5s) before they get to watch their video. But 58% of people are actively avoiding this advertising, which shows how making people look doesn’t mean to say they will look. Bronze medal this month goes to BT. 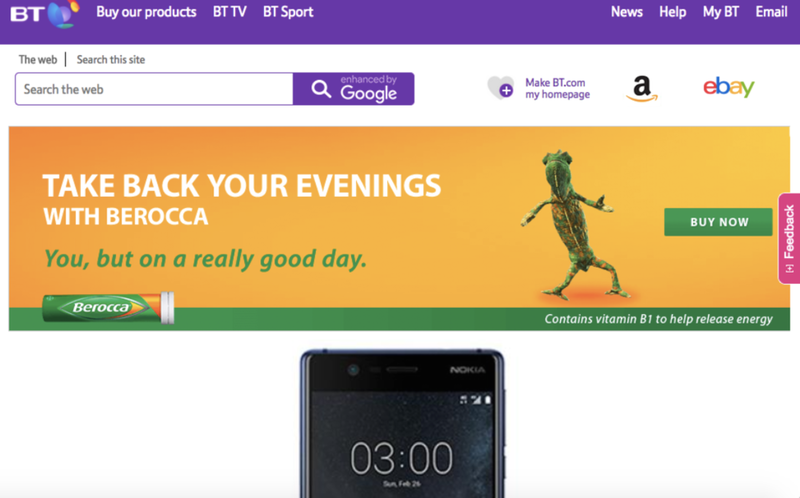 BT have proved that you don’t need to be a tech giant to know what you are doing with digital advertising. A well-designed, clean and clutter-free homepage has ensured almost a quarter of viewable ads were noticed, often for long enough to take home key messages. So, well done Facebook. But also, well done BT, for showing us you don’t need to be a tech giant to generate attention to advertising. Get in touch to receive document on implications of these findings for publishers and media buyers. Want to test your ads? Get in touch with us to test your own, we'd love to hear from you!